You'll love these beautiful, rustic southwestern barstools. Nothing completes the look in a kitchen or dining room setting like a barstool that picks up the theme in your decor. Each southwest bar stool is made of steel and finished by an artist. Shown above is the Sedona Swivel with a Kokopelli cutout in the chair back. Other styles below include the Tahoe swivel with arms and a cactus cutout and the Tahoe Barstool with Papago insert. The seat height on all three barstools is 30 inches high. Southwestern bar stools have 16 gauge steel legs with black plastic insert feet. Chair backs are made of 14 gauge steel cut by a plasma cutter. Seat plates are made of 12 gauge steel. Swivel seats have a heavy-duty 3-degree swivel and 2.5 inch thick cushion. Hand crafted in Arizona. 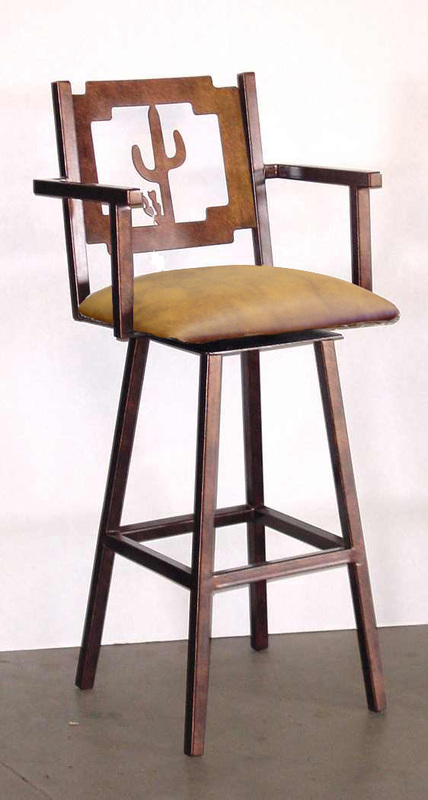 Each barstool is custom made to order, allow 4-6 weeks from order to shipment. Available in 2 fabric styles. White Fang is shown above and Leatherette is shown below. Please note: Make your selections carefully. 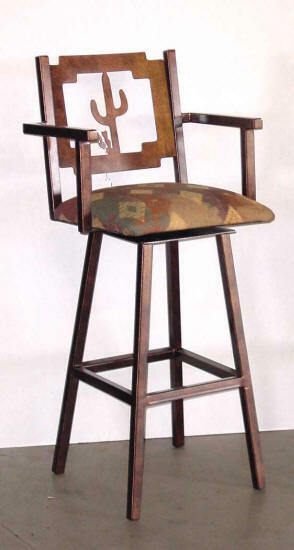 Barstools are considered a custom order and cannot be returned unless the chair is defective. Shipping charges are calculated based on the cost to ship from our facility to your door and are added when your order has shipped. We do not pad our shipping costs. If you want a shipping estimate, please contact us before placing your order. To order your southwestern bar stools, just pick from the options listed below.